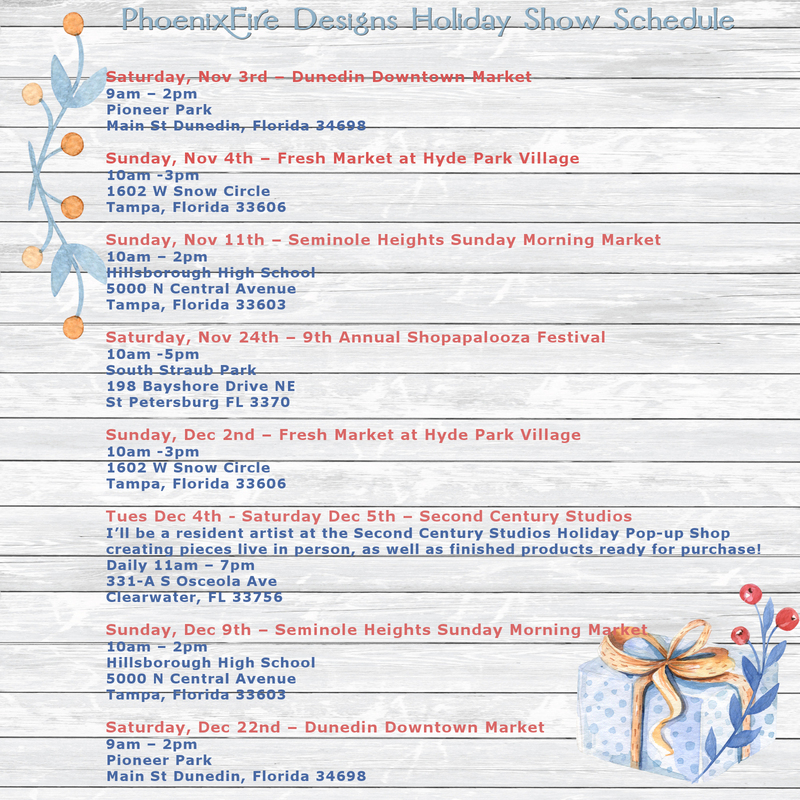 Here is where you can find PhoenixFire Designs this holiday season for your in-person shopping! Don’t forget! Online shopping – including sending directly to a gift recipient with gift wrap options available! – is available on my PhoenixFire Designs Etsy Shop or my PhoenixFire Designs Handmade at Amazon Shop. You can also request custom or personal items from either online storefront as well. *subject to USPS mailing cutoff dates and pending order processing time! *Last St. Pete Event before Christmas! *Last Hyde Park Market before Christmas! *Last Clearwater Event before Christmas! I’ll be a resident artist at the Second Century Studios Holiday Pop-up Shop, creating pieces live in person, as well as hosting a display of finished products ready for purchase! *Last Seminole Heights Event before Christmas! *Last Dunedin + ANY market before Christmas! This entry was posted in General, Shows & Events and tagged christmas schedule, holiday shows.